Sub: Travelling Allowance Rules - Implementation of the recommendation of Seventh Central Pay Commission reg. 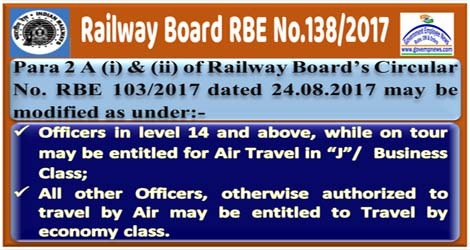 (i) Officers in level 14 and above, while on tour may be entitled for Air Travel in “J”/ Business Class. Further, it has also been decided by Board that in partial modification of item I (vii) of Board’s letter No. 2015-B-235 dated 21.07.2017, Officers in JAG/SG would be entitled for one way travel by economy class, if required on justification that Air travel is unavoidable. For JAG/SG cases of Air Travel, conditions mentioned in Note under para-22 of Delegation of powers to GM circulated vide Board’s letter No. F(X)II- 2015/PW/7 dated 12.06.2017 will need to be complied with.